Here’s Sarah Maddox, a demonstrably savvy technical writer, describing how she prepared a presentation for an upcoming summit of the Society for Technical Communication. The process, she notes, starts with “grabbing an idea when it floats by.” Indeed. How many of us on our daily rounds are struck with an idea worth pursuing but don’t jot it down, only to have it get lost in a stream of mental activity? Value such ideas, carry a pocket note pad, and write them down when they occur. Cursory as it may seem, that’s an invaluable technical discipline. An idea recorded is an idea in play. Then, Sarah advises, seek out speaking opportunities to share your ideas. That not only furthers a collegial dialogue but spreads awareness of your skills and competence. Preparing an outline is an essential step here. You don’t simply have an idea, you begin to flesh it out. And you’re after clarity, not a tangle. Then write a summary of what you’ve begun to create. 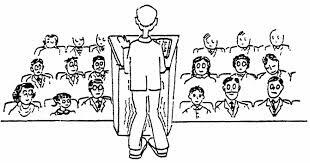 Once accepted for a program, it can be used as a “blurb” for what you intend to present. Sarah has lots of ideas for building your presentation, including taking a walk, in the woods or wherever you prefer to amble. “I don’t consciously think about the problem,” she explains, “but I’m open to suggestions from my subconscious.” When one or more arrive, she sends herself an email “or scribble a note on a scrap of paper.” The point is to preserve a promising insight. Ideas can rapidly grow complex – get those initial promptings down. Sarah’s got more suggestions, including a tip on avoiding stage fright. The best way we know to do that, though, is to be well prepared, to step up to a podium confident that you have something worthwhile to say and are sharing it enthusiastically. The likely audience reaction? Hey, this speaker may be worth heeding!